New: Axios interviews Tim Cook, Elon Musk and Bill Gates in the tech-heavy final two episodes of "Axios on HBO," airing the next two Sundays at 6:30pm ET/PT. Next week the newsletter will be off for Thanksgiving, so I'll see you Nov. 30. Thanks for reading, and if you want a daily and deeper look at China, please check out my daily Sinocism China Newsletter, now with a special discount for Axios readers, and follow me on Twitter @niubi. There are only 13 days until President Trump and Chinese President Xi Jinping are to meet in Argentina — and the leaks, rumors and guesses are flying fast. The best case scenario appears to be a tariff ceasefire with some sort of framework deal to keep talking, but based on what I am hearing, even that may be a stretch. The items on Beijing’s non-negotiable list were unacceptable to the United States, the official said, and the overall list deserved to be looked at with skepticism in part because China has previously made pledges on economic and trade reforms that it had not fulfilled. "POTUS 'is VERY sensitive to the movements in the stock mkt. The last thing he wants to do is have the mkt flat on its back going into the #G20 mtg .. Therefore, we think it's very likely that he'll tweet [or leak] more positive [China] news' -- Miller Tabak"
Quick take: At some point, won’t there be Presidential China Deal Tweet Fatigue? What we're hearing: A source tells me to expect Liu He, top economic policymaker and Xi's point man for the trade negotiations, to come to D.C. after Thanksgiving for the talks. Speaking of the possible trade deal, if Vice President Mike Pence speaks for the Trump administration on China policy, then his comments in an interview with Josh Rogin of the Washington Post should quell any optimism for a deal. In addition to trade, Pence said China must offer concessions on several issues, including but not limited to its rampant intellectual property theft, forced technology transfer, restricted access to Chinese markets, respect for international rules and norms, efforts to limit freedom of navigation in international waters and Chinese Communist Party interference in the politics of Western countries. If Beijing doesn’t come up with significant and concrete concessions, the United States is prepared to escalate economic, diplomatic and political pressure on China, Pence said. He believes the U.S. economy is strong enough to weather such an escalation while the Chinese economy is less durable. U.S. national security is in greater peril “than at any time in decades,” according to a recent report from a panel of top national security experts tasked by Congress with reviewing the state of American national defense. 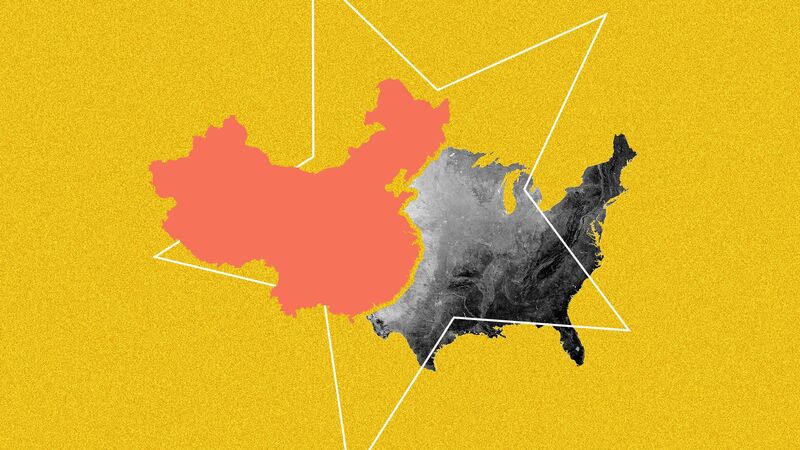 Why it matters: The U.S. has entered into an era of "great power competition" with China, which poses an unprecedented challenge to U.S. dominance both economically and militarily, and with an increasingly assertive Russia. Threat level: American military superiority has deteriorated to the point where the U.S. “might struggle to win, or perhaps lose, a war against China or Russia.” As U.S. superiority fades, the authors write, the likelihood of war rises, according to the report from the National Defense Strategy Commission. Late on Wednesday, the university, informally known as Beida, warned all students against taking part in demonstrations of support for recent labor-rights activism involving former students and said they would be held responsible if they “challenged the law”. The school believes that the majority of students are sensible, but if there are those near you who are spreading rumors or reactionary sentiments, regardless if they are your teacher or your friend or your schoolmate, please keep a firm stance,” students were told over instant messaging platforms. On Tuesday, the Communist Party committee at Beida set up new bodies responsible for disciplinary inspection tours and campus “control and management”, according to a document released by the committee and seen by Reuters, moves that tighten enforcement of party discipline. Amidst the broader tightening inside China, 2019 is a year of momentous anniversaries of student movements--the 100th of the May 4 Movement and the 30th of the Tiananmen Square protests--and Peking University was at the center of both. It certainly looks like this move may be part of the broader ideological hardening underway at Peking University and at educational institutions in general. The government also does not think current internet regulations are strong enough — so it's implementing a campaign to rein in "self-media," like blogs and social media accounts. More than 9,800 self-media accounts, referring to subscription-based accounts that are popular on WeChat, Weibo or news portals such as Toutiao, have been punished in the campaign that was launched on Oct. 20, said the Cyberspace Administration of China (CAC). The violations included defaming heroes, tarnishing the nation's image, spreading rumors and information that is sensational, lewd or pornographic, and blackmailing companies with media exposure, said the administration. "Self-media should never be a place outside of judicial reach," said the CAC. China’s cyber regulator will require detailed logs of user activity and personal information from all technology companies and online service providers with “public opinion or social mobilisation capacity” before the month’s end, the latest sign of how far Beijing is willing to go to tighten its control over the domestic internet. The Cyberspace Administration of China laid out the new rules, due to come into effect on November 30, in a notice published on Thursday. The new requirements will apply to services including online forums, blogs, microblogs, chat rooms, news providers, short or streaming video platforms and information-sharing apps, among others. My thought bubble: This move certainly looks related to the crackdown against labor activists and students, and is another sign that the political atmosphere will likely tighten even more (at least from now until June 5 after we have safely passed the 100th anniversary of the May 4 movement and the 30th anniversary of June 4). But if you are a pessimist you might wonder why they would loosen up then, especially if U.S.-China relations and the PRC economy continue in downward trajectories? Earlier this year, a petite 62-year-old woman dubbed the ‘‘queen of the Australian-China social scene’’ walked out of a US federal prison. In the blur of names and NGOs, it is easy to get confused. It is perhaps why Yan’s story has mostly been reported as a straightforward kickbacks case, a cautionary tale of avarice. Yet serving and former national security officials in Australia and the US note the pattern of conduct displayed by Yan’s NGO and the two octhers like it, along with their deep connections to the Communist Party. Under the guise of charitable and altruistic policy work, the NGOs all combined clandestine and corrupt means to influence powerful UN officials. SCMP — What does ‘opening up’ exhibition giving credit to SOEs and Xi Jinping say to China’s private firms? This week's issues of my Sinocism China Newsletter, now with a special 20% discount for Axios readers.